I’m so excited to tell you that the cover for my next book, RAVENOUS, is LIVE on YA Books Central!! GO SEE THE PRETTY! And you can enter to win an ARC! RAVENOUS will be released on 2/9/2016. Click here for more info and pre-order links! Birthday Bash + Giveaway 2015! Hey it’s that time of year again – spring! Birds are singing, flowers are blooming, and … it’s my birthday! And I’ve already got the BEST birthday present this week in the form of the gorgeous cover artwork of my next book, RAVENOUS (can’t share until later in June, but trust me it’s beautiful and so perfect for the book!!!). I kind of love birthdays and parties and cake and gifts, and especially sharing those things with my friends. So to celebrate, I’m giving away some presents (because, really, who doesn’t love presents?)! Two of my fabulous author friends happen to have books coming out in a few months (on the same day, no less – October 6), and a preorder of each is up for grabs: SPINNING STARLIGHT by RC Lewis and A MADNESS SO DISCREET by Mindy McGinnis. I’ve read them, they’re AMAZING, and you’ll get your own copy** of one as soon it releases if you win the drawing! As an added bonus, this year I’m throwing a signed copy of MONSTROUS and a sperrier* into the mix as well. Because hey, I enjoy channeling my inner Dr. Frankenstein and why not, right? *Each sperrier is unique and handmade by me, so it may not look exactly as pictured. It’ll still be cute though! **These are not ARCs, but the final editions. Yes, you have to wait a few months to have them in hand, but they are totally worth it, I promise! I know it’s been a while since I’ve posted (and I promise a post on the launch party for Monstrous is forthcoming! ), but I have a bunch of awesome events coming up in May that I must share. 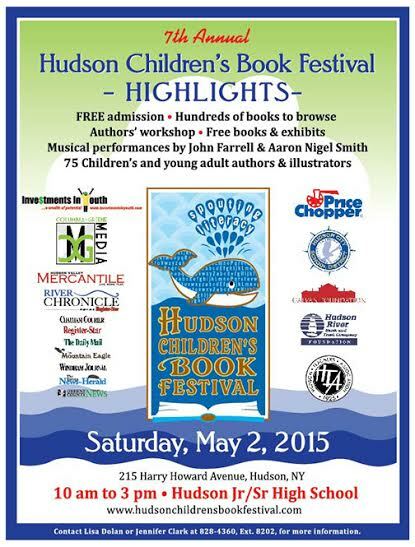 First, I’m so excited that I’ll be at the Hudson Children’s Book Festival on Saturday, May 2, 2015 – if you’re in the Hudson, NY area, please come by and say hello! On Thursday May 7 @ 7pm I’ll be joining several other authors including Lori Goldstein (Becoming Jinn), Jen Brooks (In a World Just Right), and Jen Malone (At Your Service) for an Epic YA & MG Book Trivia Night brought to you by the Boston Teen Author Festival at the Cambridge Library. Then on Saturday, May 9 @ 3pm I’ll be at Books on the Square in Providence, RI for a panel and book-related scavenger hunt along with Cindy L. Rodriguez (When Reason Breaks) and Sandra Waugh (Lark Rising). It’s Kids Books Rock day at Books on the Square with several other authors and events! And just to make that weekend even more awesome, I’ll be at the Kids Author Carnival on Saturday May 30 at the Jefferson Market Library! I’ve heard amazing things about last year’s carnival, and I’m so thrilled I get to be a part of this year’s! Monstrous is out TODAY! I’ve been working on this book since 2011, and it’s so surreal that it’s now on actual bookshelves in real stores (and virtual ones, too!). This is a real dream come true for me. It may be only one book, but so many people had a hand in bringing it to bookshelves. From my critique partners to my agent and editor to the veritable army of people at my publisher who do the behind-the-scenes work, it’s been quite the journey. Each of them left their mark on Monstrous and helped make it a story I’m so proud and thrilled to share with you! And that’s the funny thing. Now that my weird little book is out in the world, it isn’t really mine anymore. Sure, my name is on the cover, but we each bring our own experiences and quirks to a book when we read. Assumptions we make about characters and places are drawn from our own lives. Monstrous is out there for readers to like, dislike, love, hate, tell others about or ignore. No two readers will visualize Kymera or Batu or the forest or the city in quite the same way, and probably none in the way I do. Readers will give meaning to lines and phrases in ways I never imagined. And you know what? That’s actually really cool. It’s like books take on a life of their own. If you’ve already bought Monstrous, will buy it, or read an ARC – THANK YOU! I hope you enjoy the weird little world between the pages! My 2014 Goodreads Challenge Goal was to read 50 books – and I read 71!